Apply now for our Cinema, Religion, & Worldview degree program. By the Sea of Galilee: Scribner and Cinematographer Gary McLain compose a shot of Cosaert and his Bible. The Center for Media Ministry partnered with Dr. Carl Cosaert, WWU professor of Theology, to produce a six-episode TV series on the sites in Carl's famous Holy Land tour, and the gospel of Mark. Grad student Rachel Scribner, from the Cinema, Religion, & Worldview program directed the project, and Cosaert created and hosted the series. Click over the news page to see Rachel's blog posts on the adventure, and a release date, when available. Another project, the Arnion web series that our center produced in collaboration with Hope Media Europe and the North American Division is soon to be released on The Haystack. Several trailers for the series have been released on social media, and we’re looking forward to the full series soon, though an exact release date hasn’t dropped yet. 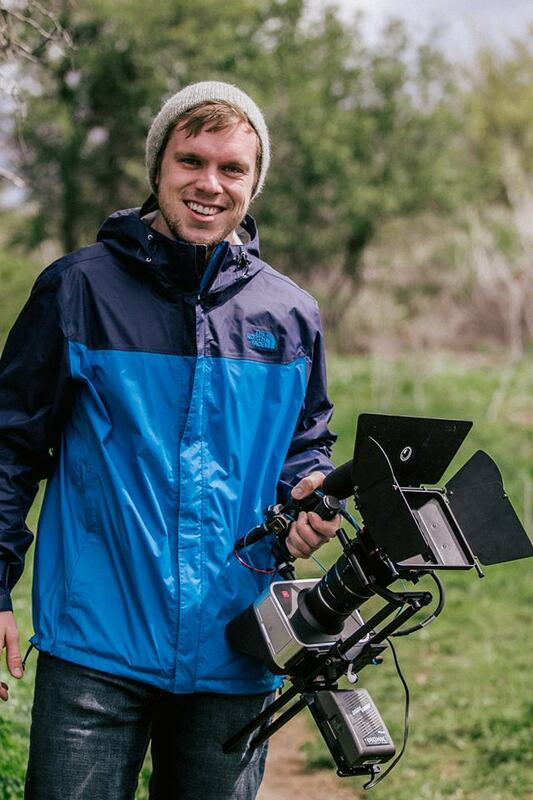 Erik Edstrom, a WWU student, during the film production of The Way a modern retelling of Saul's redemption. Our center offers a unique Master of Arts in Cinema, Religion, & Worldview. Scroll down to learn more about our degree, and the classes we offer, or submit an application completely free, with no obligation to enroll. Pro-tip: Submitting an application isn’t just for students who’ve made up their minds. If you are considering our program, apply to get in touch with professors and experts who will help you better understand the program. Our goal is to be the Seventh-day Adventist hub where students, educators, leaders, and organizations learn more about the effective use of cinema, web and interactive media, and all kinds of communication for Christ-centered ministry. Learn to lead from experts in their fields. Share important messages in innovative new ways. Our Master of Arts degree combines top-quality instruction in the narrative, artistic, and technical creation of films with some classes in web and interactive filmmaking, and related media. We also explore: sharing the gospel in non-offensive ways, foundations of Christian theology and worldview, and conversations with people of different worldviews. The MA gives serious film creators the technical, artistic and intellectual skills they need to create powerful, beautiful films and change their world. Our next degree cohort starts in August, 2018. The application deadline is August 15, 2018. Submit your application by May, 2018, and we will waive your application fee. Live at home, continue to work—an online program with short residencies. Create documentary, narrative film, interactive and mobile media, and all kinds of film and related media, and use it to change your world. Health and Wellness Promotion - Help hospitals, corporations, etc. 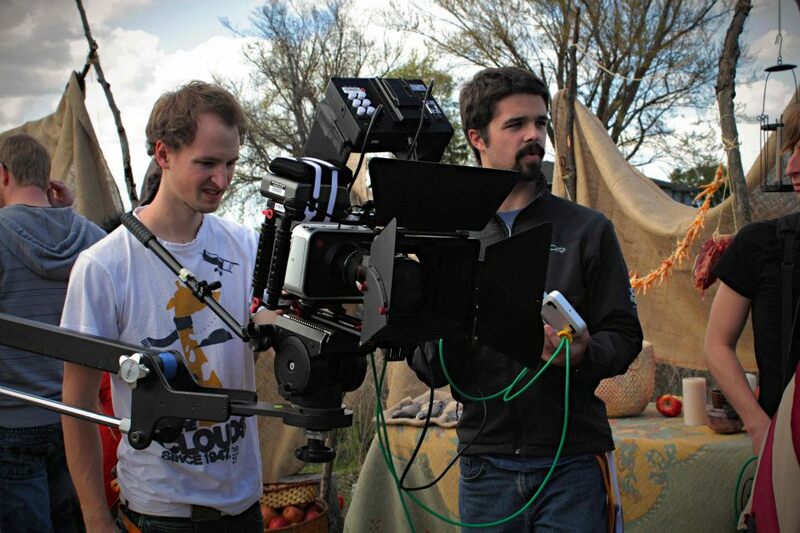 WWU students Michael Franks and Mitchell Kessler work on composing a shot. A student sets up lights for a scene inside a car. "Just telling a story. That's cinema....It's a simple story that's well-made." At the center for media ministry, we believe that cinema, web and interactive media, and other new forms of storytelling are key to communicating with the post modern world. We want to inspire our students to creativity, innovation, and excellence in all their media endeavors. Our teachers foster critical thinking and creative methods of presenting Biblical themes in today's culture and language. And we cultivate the development and use of thorough, informative research methods in media and ministry. Ellis is just completing her dissertation for a Ph.D. in Communication from Regent University where her doctoral dissertation focused on the conflict between the church and visual media--both past and present. Her Master of Arts degree is in Communication in Ministry from Spring Arbor University (2009). Her work experience includes 13 years as station manager of a Christian television ministry where she developed, produced, directed and hosted programming, led fundraising, and managed staff members and volunteers. Ellis has taught communication for close to 10 years at both Walla Walla University and Southern Adventist University. Hartman is associate professor of film, television, and culture in the Communications and Languages department at Walla Walla University. He is an active member of the University of Film and Video Association (ufva.org) and has presented at previous conferences. One of his documentaries was produced in collaboration with Indigenous and Maroon communities in Suriname, South America. Hartman utilizes a community directed filmmaking approach to empower indigenous people to tell their stories. Indigenous Suriname (2008) has screened in film festivals in the US, Ecuador, and the Caribbean as well as being televised in Suriname. In 2008, Indigenous Suriname inspired a $10,000 award to the Organization of Indigenous People in Suriname. In 2010, the documentary was translated into Spanish and the film received an award for the “social organization process of Indigenous Peoples” at the X Film and Video Festival of Indigenous Peoples, in Quito, Ecuador. The film also screened at the Smithsonian National Museum of the American Indian in New York City as part of the Native American Film + Video Festival in 2011. Hartman is also a founding member of Eclectic Reel, a nonprofit organization using media for advocacy and education focusing on community building, human rights, and environmental justice. He holds an M.F.A. (2008) from National University. Bergherm is an assistant professor in the Department of Technology’s Design Program. He teaches courses in graphics and web design. Bergherm is an Apple Certified Macintosh Technician and holds a Master of Arts degree from the Savannah College of Art and Design in Digital Photography. Bergherm continually participates in continuing education and professional development in the web design field. He participates in two e-commerce businesses where he is a general partner. His responsibilities involve managing the websites and ensuring the user experience is smooth and worry free. Bergherm is a 1999 WWU graduate with a B.A. in Commercial Art and minors in Business and Graphic Arts Technology. Dybdahl holds a Ph.D. in Missiology (2004) from Andrews University and has been teaching at Walla Walla University since 2001. His academic interest centers on the issues related to the effective communication of the gospel, especially across cultural barriers. He was born in Thailand and spent the first eight years of his life in Asia before moving to the Walla Walla valley. He graduated from Walla Walla College in 1992 as a Theology major and accepted a call to pastor in the Oregon Conference, where he served for nearly five years. During that time he earned his M.Div (1995) from Andrews University. Thomas was Dean of the School of Theology at Walla Walla University, from 2001 - 2018, and though he is now stepping down from the dean position, he continues to teach in the school. His pastoral experience ranges from small, rural, multi-church districts to large, multi-staff congregations. He has been a member of numerous denominational committees, and has twice been a delegate to a General Conference session. His academic interests lie primarily in the fields of preaching, systematic theology, and Christian apologetics. Thomas was born near Cape Town of British missionary parents. He spent his formative years in various countries in sub-Sahara Africa then emigrated to the United States. He attended Atlantic Union College, graduating in 1975 with a degree in Theology. After attending seminary, he was employed as a pastor by the Southern New England Conference where he worked for 17 years pastoring both rural and urban churches in Massachusetts and Connecticut. In 1995 he accepted a call to pastor the College Place Village Church. He holds a Doctor of Ministry Degree from Andrews University.